Cuvier's beaked whale or the goose-beaked whale (Ziphius cavirostris), the only member of the genus Ziphius, is the most widely distributed of all the beaked whales. It is one of the most frequently seen beaked whales, despite preferring deep pelagic waters, usually deeper than 1,000 m (3,300 ft). The species name comes from Greek xiphos, "sword", and Latin cavus, "hollow" and rostrum, "beak", referring to the indentation on the head in front of the blowhole. The French anatomist Georges Cuvier, in his treatise Sur les Ossements fossiles (1823), first described the species based on an imperfect skull from the Mediterranean coast of France. It had been obtained by M. Raymond Gorsse in the department of Bouches-du-Rhône, near Fos, in 1804 from a local who had found it on the seashore the previous year. Cuvier named it Ziphius cavirostris, the specific name being derived from the Latin cavus for "hollow" or "concave", in reference to the deep hollow (the prenarial basin) in the skull, a diagnostic trait of the species. Cuvier believed it to represent the remains of an extinct species. Zoologists did not realize the extant nature of the species until 1850, when Paul Gervais compared the type specimen to another that had stranded itself at Aresquiès, Hérault, in May of the same year, and found the two to be identical. There is no connection between Cuvier's beaked whale and the mythical Ziphius, or "Water-Owl", a creature in medieval folklore which had the characteristics of both an owl and a fish. Its dorsal fin was said to be sword-shaped, and pierced ship's hulls, while the beak was said to resemble an owl's head. 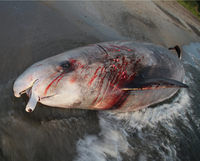 The body of Cuvier's beaked whale is robust and cigar-shaped, similar to those of other beaked whales, and can be difficult to distinguish from many of the mesoplodont whales at sea. It grows to about 5–7 m (16–23 ft) in length and weighs 2,500 kg (5,500 lb). No significant size difference is seen between sexes. Its dorsal fin is curved, small, and located two-thirds of the body length behind the head. Its flippers are equally small and narrow and can be tucked into pockets in the body wall, presumably to prevent drag while swimming. Like other beaked whales, its flukes are large and lack the medial notch found in all other cetaceans. The head is short with a small, poorly defined rostrum and a gently sloping melon. A pair of throat grooves allows the whale to expand this region when sucking in its prey. Cuvier's beaked whale has a short beak in comparison with other species in its family, with a slightly bulbous melon, which is white or creamy in color, and a white strip runs back to the dorsal fin about two-thirds of the way along the back. The rest of the body color varies by individual: some are dark grey; others are a reddish brown. Individuals commonly have white scars and patches caused by cookiecutter sharks. The dorsal fin varies in shape from triangular to highly falcate, whilst the fluke is about one-quarter the body length. They live for around 40 years. Cuvier's beaked whales feed on several species of squid, including those in the families Cranchiidae, Onychoteuthidae, Brachioteuthidae, Enoploteuthidae, Octopoteuthidae, and Histioteuthidae; they also prey on deep-sea fish. In 2014, scientists reported that they had used satellite-linked tags to track Cuvier's beaked whales off the coast of California, and found the animals dived up to 2,992 m below the ocean surface and spent up to two hours and 17 minutes underwater before resurfacing, which represent both the deepest and the longest dives ever documented for any mammal. Cuvier's has a cosmopolitan distribution in deep, offshore waters from the tropics to the cool, temperate seas. In the North Pacific, it occurs as far north as the Aleutians and in the North Atlantic as far north as Atlantic Canada in the west to the Shetlands in the east. In the Southern Hemisphere, it occurs as far south as Tierra del Fuego, South Africa, southern Australia, New Zealand, and the Chatham Islands. It also frequents such inland bodies of waters as the Gulfs of Mexico and likely the Caribbean and Mediterranean Seas. Mediterranean population is genetically distinct from North Atlantic population(s). Cuvier's beaked whale may be one of the most common and abundant of the beaked whales, with a worldwide population likely well over 100,000. An estimated 80,000 are in the eastern tropical Pacific, nearly 1,900 are off the west coast of the United States (excluding Alaska), and more than 15,000 are off Hawaii. In 2011, a tagged Cuvier's beaked whale dove to 2,992 m, (9,816 ft) which is the deepest recorded dive by any mammal. The whales' rib cages can fold down so as to reduce air pockets and decrease buoyancy. Japanese whalers in the past opportunistically caught Cuvier's, taking between three and 35 each year (before 1955). The species has been reported taken incidentally in fisheries in Colombia, the Italian swordfish fishery, and in the drift gillnet fishery off the U.S. west coast, where between 22 and 44 individuals died each year off California and Oregon from 1992 to 1995. Cuvier's beaked whale is covered by the Agreement on the Conservation of Small Cetaceans of the Baltic, North East Atlantic, Irish and North Seas (ASCOBANS) and the Agreement on the Conservation of Cetaceans in the Black Sea, Mediterranean Sea and Contiguous Atlantic Area (ACCOBAMS). The species is further included in the Memorandum of Understanding Concerning the Conservation of the Manatee and Small Cetaceans of Western Africa and Macaronesia (Western African Aquatic Mammals MoU) and the Memorandum of Understanding for the Conservation of Cetaceans and Their Habitats in the Pacific Islands Region (Pacific Cetaceans MoU). Beaked whales may also be sensitive to noise: a higher incidence of strandings has been recorded in noisy seas such as the Mediterranean, and multiple mass strandings have occurred following operations by the Spanish Navy. Its nearest relative, the only other living member of the subfamily Ziphiinae, is Shepherd's beaked whale (Tasmacetus sheperdi). ^ a b William Perrin (2014). Perrin WF, ed. "Ziphius Cuvier, 1823". World Cetacea Database. World Register of Marine Species. Retrieved March 16, 2015. ^ Grzimek, Bernhard (2003). Hutchins, Michael; Kleiman, Devra G.; Geist, Valerius; et al., eds. Grzimek's Animal Life Encyclopedia, Vol 15, Mammals IV (2nd ed.). Farmington Hills, MI: Gale Group. ISBN 0-7876-5362-4. ^ "Cuvier's Beaked Whale (Ziphius cavirostris)". NOAA. 15 January 2015. Retrieved 29 March 2017. ^ Turner, W (1872). "On the occurrence of Ziphius cavirostris in the Shetland Seas, and a comparison of its skull with that of Sowerby's whale (Mesoplodon Sowerbyi)". Transactions of the Royal Society of Edinburgh. Edinburgh. 26 (4): 759–80. doi:10.1017/s0080456800025618. OCLC 26145032. ^ Naish, Darren. (2014). Book Review: Sea Monsters on Medieval and Renaissance Maps. Tetrapod Zoology. ^ a b c Heyning, John E (2002). "Cuvier's Beaked Whale". In Jefferson, Thomas A. Encyclopedia of Marine Mammals. Academic Press. pp. 305–7. ISBN 0-12-551340-2. ^ Evans, Peter GH (1987). The Natural History of Whales and Dolphins. New York: Facts on File Publications. ISBN 0816017328. OCLC 14271801. ^ a b Gregory S. Schorr; Erin A. Falcone; David J. Moretti; Russel D. Andrews (2014). "First long-term behavioral records from Cuvier's beaked whales (Ziphius cavirostris) reveal record-breaking dives". PLOS ONE. 9 (3): e92633. doi:10.1371/journal.pone.0092633. PMC 3966784. PMID 24670984. ^ Reeves, Randall R; Stewart, Brent S; Clapham, Phillip J; Powell, James A (2002). National Audubon Society Guide to Marine Mammals of the World. Alfred A. Knopf. p. 254. ISBN 0375411410. ^ Palmer, Jane (15 January 2015). "Secrets of the animals that dive deep into the ocean". BBC Earth. Retrieved 16 January 2015. Carwardine, Mark; Camm, Martin (2000). Whales, Dolphins and Porpoises. London: Dorling Kindersley. ISBN 0-7513-2781-6. Wikimedia Commons has media related to Ziphius cavirostris. This page was last edited on 11 March 2019, at 18:39 (UTC).